If God exists, He is there, in the small, cast off pieces, rough and random and no two alike. Take several broken pottery shards in your hands and hold them. Acknowledge present or past feelings and memories of time in which you were broken – broken hearted, broken by illness or loss. Hold these feelings and memories with compassion. Reflect on ways in which you have been closed, afraid of change, rigid, trying to defend yourself against further hurt, further experiences of being broken. And then imagine trusting your heart to break open, to surrender to new life, to let go of what no longer serves you so that some new life can be born within you. See the shards in your hands as the pieces of your former self, broken open through struggle, through growth and change. Imagine bringing these broken pieces of self to the mystery you know as the God whose son shares with us all of what it means to live in a breakable body, with a breakable heart. 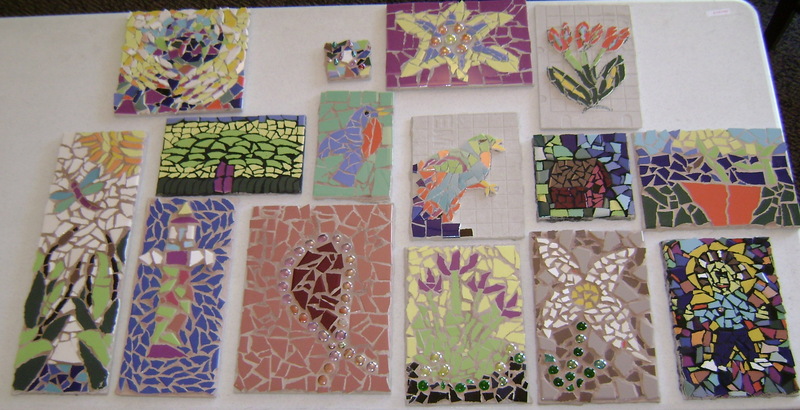 Ask God to help you piece these shards together into a new mosaic. Spend time in silent meditation, breathing and observing, and see if an image for this living mosaic might form in your imagination. The mosaics above were created in response to this reflection. I love spring! And despite my longing for it all winter, I am still amazed each year by the surge of physical and creative energy that wakes in me as the days warm and the forest wildflowers bloom. Yesterday and today I have been especially aware of a persistent feeling of deep contentment and a gratitude for ordinary moments (like watching the cat’s natural mindfulness as she sits on cushion by the open window). Here are some suggestions of art meditations I have found to be “keepers” in my own personal practice. I will post other art meditations throughout the year, but these are ones that nurture the spirit of spring! Fresh Air Painting: Take a box of watercolors, some watercolor paper, a pencil, some brushes and water with you on a hike in the woods. Look for as many kinds of spring ephemeral wildflowers as you can find. Choose an area to sit and make loose, playful sketches of some of these flowers, and paint them. Don’t be fussy or driven to make a “perfect” painting. Let the water, sunlight, and wind help you relax and play. During times when you are waiting for washes of paint to dry, sit being aware of your breathing and practicing being present to the moment. Begin a Creative Compost Pile: On a regular basis, spend time doodling, experimenting, improvising, “fishing” for images and inspiration. These experiments can be visual sketches, creative writing, song lyrics, etc., etc…! Collect what you make, rejecting and discarding nothing. Trust that from your experiments the fertile soil of your creative garden will be replenished and something unexpected will begin to grow. Resurrect a “Failed” Art Project – Return to something you created in the past year that was either left unfinished, seemed to come to a dead end, or was rejected by you for some reason or another. Begin working with it again, transforming it subtly or even radically. Let it be like a seed, or like a bulb that has been dormant in the dark earth but from which now some unexpected new life can burst. Do not worry about returning to the original intent of the project. Let your present life add to and change the original piece. Listen to what the original piece now communicates to you and then, through a new creative engagement with it, make an unexpected response. 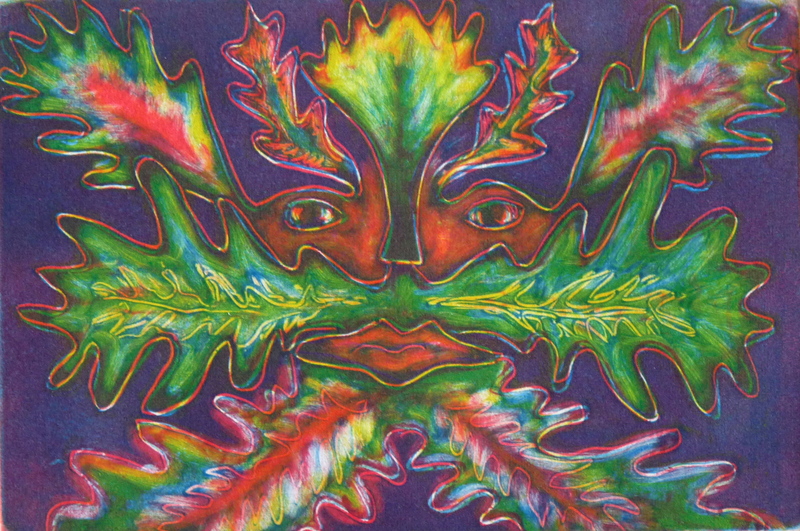 You are currently browsing the Expressive Art Therapy and Dreamwork with Liza Hyatt weblog archives for April 2010.